Today is the 50th anniversary of the independence of Tanganyika Territory from Britain - an event celebrated and commemorated as Uhuru, meaning freedom or emancipation in Swahili. Tanganyika united with Zanzibar in 1964 to become Tanzania, the country I regard as my second home. I wish its citizens well on this special day. 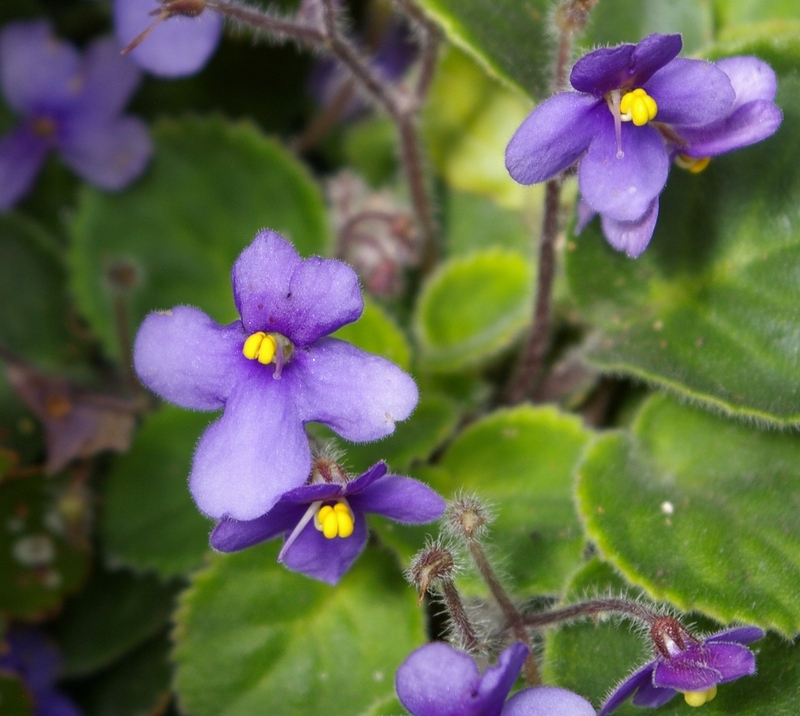 To mark the occasion I thought it would be interesting to think of two important horticultural plants originating in Tanzania, the African Violet Saintpaulia ionantha and Busy-lizzie, Impatiens walleriana. Most of the country is too low-lying and hot for its plants to be cultivable in anything but very specialised conditions, but the mountains rise to more temperate elevations. Although there are true alpines on the highest peaks they have also proved to be impossible to cultivate successfully, and these two species come from forested areas that are warm, but not too warm. The story of the discovery of Saintpaulia ionantha is quite well known: it was discovered in the hills above the coastal town of Tanga in 1892 by Baron Walter von St Paul-Illaire, a German colonial administrator. He sent seeds to his father in Germany, who in turn supplied plants to the Herrenhausen botanical garden near Hanover. There they were recognised to belong to a new genus, which was named Saintpaulia. The modern view is that they are extremely closely related to Streptocarpus and could indeed be placed in that genus, but the flower shape is very distinct, making the continued separation useful. Saintpaulia was soon recognised to be a useful ornamental plant, with the German nurseryman Ernst Benary offering plants in the 1890s, but the potential of African Violets as houseplants was not realised until the Californian nursery Armacost and Royston released a series of named and possibly hybrid cultivars in 1926, including the famous 'Blue Boy'. Its popularity increased after the Second World War, when African Violets became incredibly popular and breeding and selection took them to new levels. In Britain Rochfords, the great houseplant specialist, and the breeder Tony Clements popularised them, and with their ease of propagation (poking a leaf through tinfoil into a jar of water) they were easily passed around. These days their star has waned, though they are still ubiquitously available: I saw a pair of plants shivering on the pavement outside the Cirencester pet shop yesterday. Their native forest habitat in the ancient mountains of eastern Tanzania is now greatly threatened and many populations have been lost, but it is the plants' adaptation to this habitat that makes them so successful as houseplants. They're tolerant of low light conditions, and seasonal rainfall and their habit of growing in thin soil over rock enables them to withstand erratic watering in the home, while the equable temperatures of the forest understorey are imitated by central heating. Looking back it now seems very odd that in my youth Impatiens walleriana was still recommended as a houseplant for growing in pots, to be propagated in much the same was as Saintpaulia and, like it, passed around via plant stalls at church fetes. The development of the Busy-lizzie from a rather gawky potplant to a universal dumpy, floriferous bedding plant in the past three decades has not, to my knowledge, been properly explored and documented. The wild species Impatiens walleriana is found in the mountains of a wide area of eastern Africa, from Kenya to Zimbabwe and Mozambique, but it was introduced from Zanzibar to Kew in 1896, supposedly by the British consul and keen botanist Sir John Kirk, though I think this story (related by the botanical historian Alice Coats) needs investigating. For a long time it was known as Impatiens sultani, in honour of the Sultan of Zanzibar. In the wild it is a plant of disturbed damp places - alongside pathways in the forest, for example, usually with flowers of magenta-pink, but they are variable in shade, giving breeders plenty to work with. And how the breeders have worked with it, making it the second most popular bedding plant in the world (after pansies) and a staple of the summer garden. Now its existence as a bedding plant is threatened by the disease Impatiens downy mildew, so its days of eminence are probably numbered - the snootily-derided Busy-lizzie will be much missed.